At times, it seems that contemporary nuns exist solely for the purpose of parody. 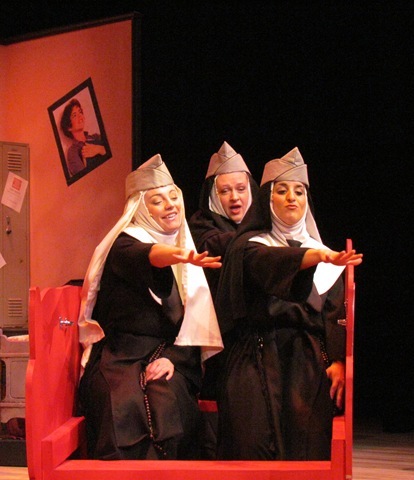 Dan Goggin’s 1985 musical Nunsense, stemming from his line of nun-humored greeting cards, was revolutionary when it came onto the scene with the inappropriate light it shed on the Sisters from Hoboken. Presently, Catholics aren’t in a great place for satire. Financial trouble, dwindling numbers, lawsuits and mainstream appeasement make the once-dominant entity lean closer to the Little Man than the Oppressor. Satire, of course, is all about poking holes in austerity and knocking the Big Man of his ladder; the Church has done a fine job of that on its own. Goggin’s play is more of a nostalgia-bath than a roast, but even so, with Catholics dismissing old-school severity and hands-off ornamentation in favor of a more accessible image, jokes dependent on being silly or naughty with full-habit donned sisters just don’t have the pop they used to. Nevertheless, Metropolis’ production certainly rejuvenates the undeniable phenomenon. The morbidly clever conceit is that 52 Sisters have died after being poisoned by the convent cook, Sister Julia Child….of God. The surviving nuns were at bingo that night and skipped out on the killer soup. In order to raise money to bury the remaining dead nuns, Sister Mary Regina (Nancy Kolton) organizes a nun-produced fundraiser talent show. The proceedings offer belting nuns, the amnesiac nuns, the cooking nuns, the nuns getting stoned, the nuns kick line-dancing, the nuns shuddering at the scandalous length of Marilyn Monroe‘s skirt, and the nuns mispronouncing pop culture references. Mere redundant gags, they aren’t. No, these are test subjects, empirical data in an unscrupulous study that combs every aspect of convent-oriented humor which lead to the likes of Sister Act and Late Nite Catechism. When entering Metropolis’ gorgeous Arlington Heights performing arts centre, you may think you’re entering the space of ATC’s Original Grease as the scenic designer, Michael Gehmlich, has created a set that perfectly mimics an old Catholic high school gym-atorium with glittery hand painted Grease posters complimented with Jesus on the cross in stained-glass illuminated above in the rafters. Yousif Mohamed’s lighting design expertly fills the expanse of the space and the light shifts play to the comedy sharply. The success Nunsense and its sequels have enjoyed over the past two and half decades is nothing to shake a ruler at. 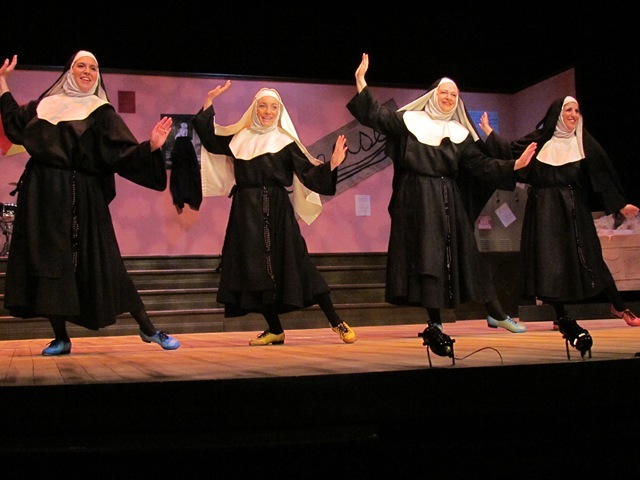 You might even call Goggin’s shows “Nunsations” (oh wait, he already gave sequel number six that title). After glancing around at the Metropolis audience, it was easy to see why: buried shallowly under stabs at modernization (Snooki and Donald Trump references, anyone? ), this nun-humor is an excuse to reminisce. Current and recovering Catholic school alumni eat up an allusion to student-herding clickers. The rest of the proceedings are slathered in well-meaning silliness and elbow-nudging puns. 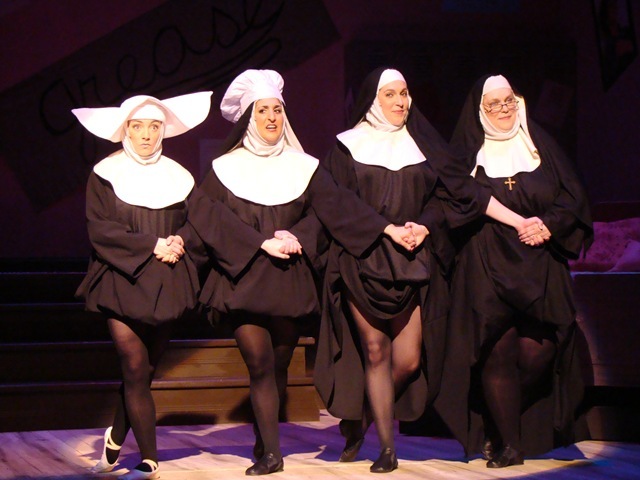 If you did happen to grow up going to Catholic school, and you haven’t experienced Nunsense, Metropolis’ production is about as fun as this show gets, so “get thee to a nun-…” well, just check out this fine revival of a silly musical sensation that seems to be sticking around at least as long as there are baby boomers still around to repent. 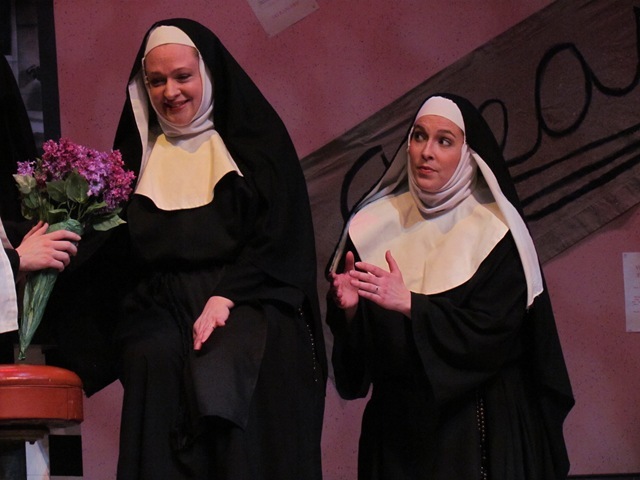 Performances of Nunsense continue through June 19th. Schedule varies week to week and includes evening and matinee performances. The running time is approximately 2 hours with one intermission. Tickets range $35 – 43 and can be purchased online at www.metropolisarts.com or by calling the Box Office at 847.577.2121.